In my last posting, I completed the commentary on Page One. Before I start in on Page Two, I want to share a few thoughts. My plan is to record my conversation with the foods I began drawing back in early 2011. It’s taking a bit more time than I thought, but so be it. However, I don’t want to lose sight of the fact that EAW is an ongoing project. I’m still drawing and over time, my drawings have, shall we say, evolved. I am sticking with my intention not to judge what I draw or write on the art work. Owning what I’ve done, whether I think it’s ‘good’ or not, is akin to owning myself, just as I am, at this moment in time. Pretty basic, but also kind of exhilarating, liberating, if you will. For the first few months, I would make a rudimentary sketch that represented the food item and that was fine. Then one day, I had a clementine on my desk and I actually looked at it as I was drawing. It took longer to draw, but I liked it. A few weeks later I drew a half grapefruit and really got into it: I played with mixing colors, trying to show texture and three-dimensionality. That was a breakthrough drawing and it’s the logo for my business, Assembling a Cooking Life. It also shows up in the header collage here on the EAW blog. I’m still drawing, 18 months later, and enjoying it more and more. I don’t know quite how to describe it, but the time I spend drawing not only makes me happy, but it builds my relationship with the food item and it adds another layer of awareness to my eating choices. It ‘keeps me busy’ in a good way and keeps me away from mindless eating. And all of that was the original motivation for starting this project, so it’s kind of cool, and surprising too, that it’s working out that way. So here is a drawing of a strawberry that I did last week. It was really fun, hard work and satisfying. Satisfying is a key word, because mindless eating (of things like lousy vegan rugelah…) is actually not satisfying. It does not fill me up with happiness. 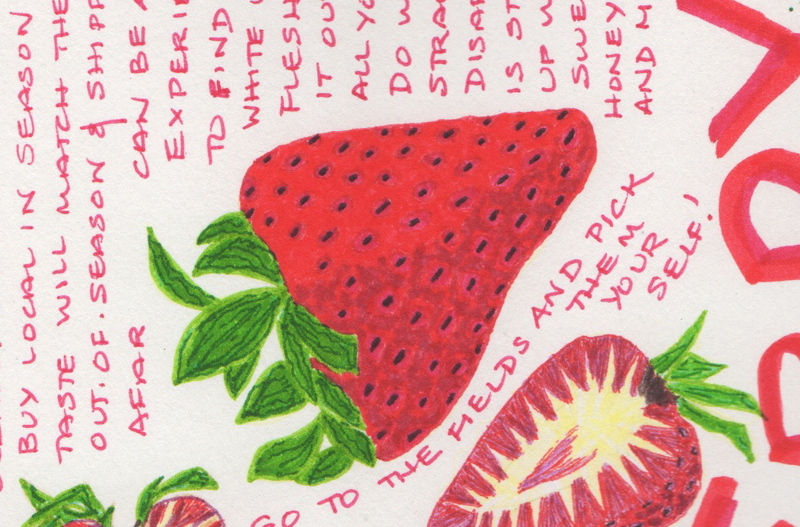 But the study of that little strawberry and how the rows of tiny seeds line up…I got a real kick out of that. I’m not saying that getting into detailed drawings is the answer for everyone. Cartoon-like drawings serve the same purpose of conversing with food. And I still think of myself as a writer, not a visual artist. But I am having fun. So there. Now, a first look at Page Two. I’ll start with the upper right, where items are linked: from a freeform fennel to jelly beans to marshmallows. Fennel lurked in the back of my awareness for a long time. I tried growing it in my garden, but had no luck. I’ve mainly tasted it in salads prepared by our friends B&E over the years. When I bought it and started using it in salads myself, or simply sliced as a snack…well, it was like the radish experience, I guess. Sweet, juicy & crunchy. This drawing is awful, but I want to try a ‘still life’ drawing from an actual fennel bulb one of these days. Fennel led me to jelly beans. I’ve always loved the black jelly beans the best, for the licorice/anise flavor. But I don’t really like jelly beans. Gummy, chewy, stick-to-your-teeth-y. Somehow that seems related to not liking puddings or custards very much. I guess I want crunch. Whatever my sweet is, gimme crunch. In the corner below the jelly beans I drew a marshmallow, which is something that I like even less than jelly beans. I might eat some jelly beans if I’m craving sugar, but I don’t think I’d eat a marshmallow, even if I were desperate! The mouth-feel, yuck. Even the thought of the mouth-feel makes me want to gag. I do enjoy toasting marshmallows over the coals of a wood fire. Getting them evenly browned, without burning is a fun challenge. And you would think that I’d like ‘S’mores’, with their attendant chocolate & graham cracker. Nope. The marshmallow just kills it. Too sweet. The crudely drawn finger rolls alongside the jelly beans and marshmallow are a sometimes treat…like scalli bread, but scalli is better. What is the mood or need that makes me want fresh soft ‘nothing’ bread? It’s clearly about the inside, because the crust of a finger roll is nothing. In fact, the finger roll itself is sort of a bread marshmallow. Not as sweet, of course. Maybe it’s something about the size. Yeah. With butter or peanut butter inside, they do travel well, in the car or wherever.